The flop is where the hand really starts to come together, and players start to evaluate the strength of their hands and make decisions based on their potential. You should always look to analyse the texture of the flop and consider what it could mean to both you and your opponents. Being able to fully understand the flop texture and what potential the cards on the flop contain is a key skill that every good poker player is looking to develop. Being able to identify the nature of the flop and how it affects your own hand and your opponents' possible hands is key to being able to play this betting round as profitably as possible. Flop strategy can involve all different types of mathematics; both for players with made hands and for players with drawing hands. Therefore it is important to know how to size your bets and raises to make sure that you are making profitable moves at every opportunity. 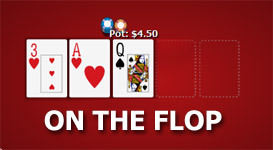 Playing the flop can range from being fairly easy to difficult depending on the situation. The flop can often be relatively simple, and you are completely happy to either fold or raise with your hand when the action reaches you. However, the flop can be tricky to play when out of position or when in a multi-way pot, so more thought may be needed to work out the best plan of action in these situations. The texture of the flop. Are there any straight possibilities? Are there any flush possibilities? These questions simply highlight the possibility that there may be potential for players to have drawing hands. It is important to take into account the fact that some players may have drawing hands because it will affect the way the hand will be played out. This is because where normally you might expect a player to call a bet with a made hand, players may now be calling bets because they have a draw to a stronger hand. The more draw possibilities there are on the board, the "wetter" it is. Think of "wet" as meaning slippery and dangerous. How to approach the flop. Your hand did not improve. You are on a draw. 1] Your hand did not improve. The first situation is pretty simple to address, because if your hand did not improve then you should simply look to let the hand go at the nearest opportunity, or hope to see another card for free and possibly improve. But at the end of the day, you are not really in much shape to win money from the hand on this occasion. - Decent Hand (any pair, middle pocket pair, top pair with weak kicker). In these situations I like to bet out to see where I stand if there is no action before me. If I get a call I will consider my options on the turn depending on what card comes down. If I am raised I will usually tend to fold unless I have a strong reason to believe that my opponent is bluffing. If I am faced with a standard raise then I will normally call with top pair but fold any lower pairs. I am not prepared to get involved in too much action with these hands. With these hands I am more than likely to have the best hand at this point, therefore I will be and raise to make sure that I give the wrong pot odds to anyone looking to call with a drawing hand. You should never slowplay in these situations as your hand is nowhere near strong enough to give other players a free card to catch up, so make sure you are betting and raising to give your opponents bad odds and increase the amount of money you can win from the hand. Again with these hands I will normally want to bet out to get as much money into the pot as possible. I am not necessarily looking to ‘protect’ my hand as much as before, but more to give myself the best opportunity to win a big pot. Some players will like to slowplay here, but in my opinion you will just be missing out on an opportunity to build the pot. It is also a good idea to bet with weak flushes and give bad odds to anyone who is looking to call with a high card of the same suit as the flop for a flush of their own. Make the most of this situation, because it’s not going to happen very often. It is in these rare instances that I will look to slowplay to try and allow my opponents to catch up, but it is not likely that I am going to win too much money from these hands anyway. So just try and extract as much money as you possibly can, but do not be too disheartened if you end up winning a small pot. 3] You are on a draw. Now if you have a drawing hand on the flop, you will want to try and see the turn card as cheaply as possible in an attempt to complete your draw. It is not often that you will be given 4 to 1 odds (roughly the pot odds you need to call for a straight or a flush) at this point, so you will have to consider the chance that you will win more money from the hand than is already in the pot. This is known as your ‘implied odds’. All this info may seem a little overwhelming at first, but in general just try not to pay too much for your draws, and try and see the turn as cheaply as possible. If you are feeling a little adventurous, you can always come out raising from time to time with a draw to disguise your hand and keep your opponents guessing. Good flop strategy involves always trying to consider what your opponent may be holding as well as thinking about the potential of your own hand. For example, if your opponent made a strong raise before the flop, they may well have high cards like AK or AQ. So if the flop comes 8 2 4 you can be fairly sure that your opponent’s hand did not improve. Whereas if the flop comes A K 5 , you can be confident that your opponent has caught a piece of the flop and is more likely to have improved. Always try and give the wrong pot odds to any player looking to call with a draw. You can never be totally sure that your opponent has a draw, but it is better to bet assuming that they are on a draw rather than betting assuming that they aren't. By giving your opponents the wrong odds to chase, you will be making money every time they call. However, you will be losing money if your give your opponents good odds and they call. Always assume that your opponent has a potential drawing hand. It's always better to give your opponent the wrong odds to call as opposed to good odds. Be prepared to let good hands go. If you have a good hand but come up against a lot of action or are out of position to a raise, you should try and lean toward letting your hand go. It may be difficult to fold good hands, but it is far better to drop the hand early and save yourself from losing more money later in the hand. The best winning players wouldn't win money if they didn't fold the best hand occasionally.